RVS Technology integrates with the original surface creating a mirror-like Triboceramic surface on the friction zones of mechanisms. As a result a worn mechanism is restored to near or original specification due to friction decreasing with tolerances and compression restoring to, or close to original specification. Building new material, not polishing! 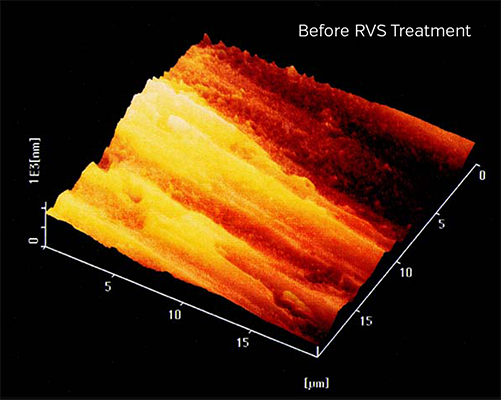 RVS Technology treatment grows new surface material to all those friction surfaces that are in contact with the oil. The metal ceramic surface is formed only in the areas in which there is friction and the abrasion occurs only in those areas where the surface has breaking peaks in the surface. In addition, the new surface created is much harder and smoother than the original. 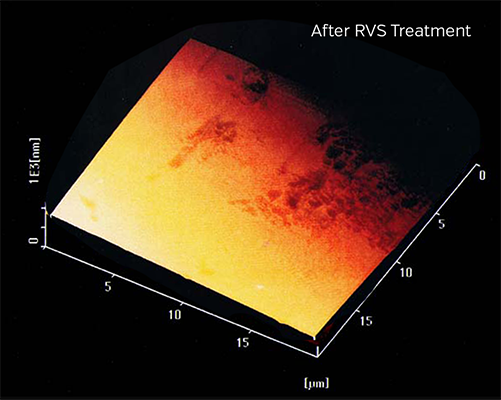 Seen here is a laser microscope image of a camshaft before and after RVS Technology treatment. What exactly is RVS Technology®? RVS Technology® Tribo(nano-)Ceramics can be considered as an advanced mode of cure for engines, gearboxes, and other mechanisms. If your device has normal wear problems like noise, smoking, too high consumption of oil or fuel, decrease of power and compression level, unbalance and vibrations RVS Technology has the capacity to restore it. RVS Technology works also as a preventive method, protecting your mechanisms against coming wear. For example treatment of car parts will protect your car from serious problems in the future. What does RVS mean ? Is RVS an oil additive? No! Unlike oil additives on the market, RVS Technology® products produce a nano-ceramic layer that integrates with the metal friction surfaces of your engine, transmission, differential etc. That’s why it lasts at least 60,000 miles (or 2500 hours in machinery) and oil changes do not affect it. RVS does not affect the properties of oil. The idea of oil additives is to improve the oil’s properties and have to be re-applied at every oil change. © 2017 RVS USA. All Right Reserved.